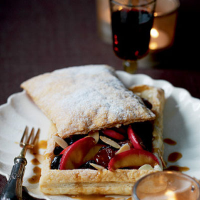 These individual sticky, fruit-and-nut puff pastry cases make a stylish end to a meal and are best enjoyed drizzled with pouring cream. Preheat the oven to 200°C, gas mark 6. Place the dried fruit in a bowl, add the brandy or Calvados and set aside. Unroll the pastry and cut into 4 rectangles. Put on a baking sheet then score a line 1cm in from the edges of each piece, without pressing all the way through. Cook for 10 minutes, then remove the top layer of loose pastry to make a lid, leaving some on the base. Place on the side of the baking sheet and cook for a further 10 minutes until golden. In a small frying pan, dry-fry the almonds for about a minute until golden, remove from the pan and reserve. Cut the apples into quarters, discard the cores, then thinly slice. Melt the butter in a large frying pan over a medium heat, add the apple and sprinkle with the sugar and nutmeg. Sauté for 4-5 minutes until golden on both sides. Using a slotted spoon, transfer the apple to a plate. Return the pan to the heat and add the mixed fruit and brandy. When syrupy, stir in the cream then spoon into the pastry cases. Top with the apples and scatter over the flaked almonds. Place the pastry lids on each case, dust with icing sugar, and serve with pouring cream. Swap the apples for firm, slightly under-ripe pear slices, if you prefer. Enjoy a sweet port with these sticky, fruit pastries.